The cooler weather of today feels much more comfortable than the sudden shock of hot weather I had earlier in the week. So far, cooler weather hasn’t seemed to slow the galloping greenery that the hotter temperatures instigated. Now that it’s almost May, I suppose nothing will slow it for long. 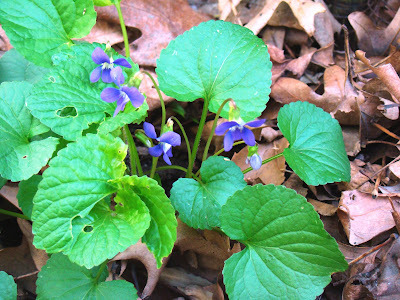 The latest wildflowers to appear outside the cabin door are these "common blue violets," also known by the names of meadow violet and woods violet, among others. I guess if you see them in a meadow, it’s safe to call them meadow violets, but if you see the same thing in a forest, you can call always those woods violets. Like people, they can live in a lot of different places and can be happy in sun or shade. These violets are literally right outside my front door by the edge of the last step off the porch, and I have to be careful not to step on them. I have to make sure the dogs don’t clumber over them, too, when we go in or out of the door, because they could care less about pretty little violets. This particular patch has been in the same spot ever since I moved into the cabin. It’s a nice little clump of them, but they are common so it’s not the only one. Common doesn’t mean they aren’t pretty, though. Last evening was hot and the windows of my cabin were all open. The sun was down but hadn’t been down for long, and the evening had not yet cooled. I was thinking it would be hours before the evening felt comfortable enough for sleep. And then I heard a distant sound and stopped what I was doing to listen. The wind was rising. The front that was to cool down the weather was on its way, the more distant trees of the forest already announcing its arrival. I went around the cabin, starting to close windows, thinking the wind would also bring rain or thunder. The sound of wind racing through the trees grew ever louder until it reached the trees around the cabin. The wind was cool. Instantly, the temperature dropped and the evening felt fresh. No rain or thunder came with this front, just the wind. Spring is back. 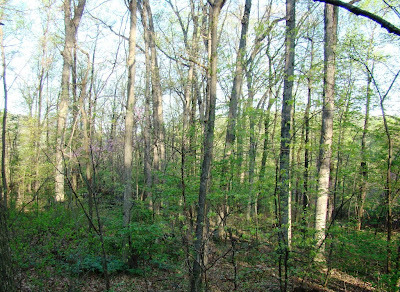 But while summer was here for a brief, early visit, the woods changed dramatically and overnight. I am already losing my winter view, as you can see by this morning’s photo. I hope the return to spring temperatures will slow this progress a little, but I’m not going to count on it. Soon, I’ll be encased in greenery again and won’t see the distant mountain again until fall when the leaves drop. 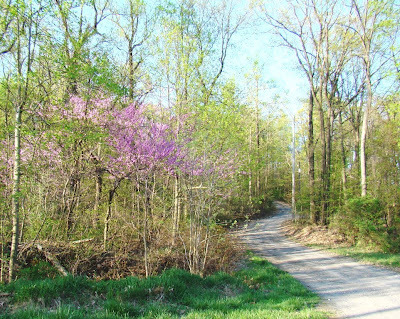 The redbud is budding right now. Yesterday morning this tree was barely pink, and this morning, well, as you can see. Two days of 90 degree heat have acted like rocket fuel to push the greenery at a speed almost impossible to believe. Since I’ve seen it happen, I know it’s not impossible, but still. Boy, that was quick. This hot spell is supposed to end when a storm passes later today, and I’ll be glad to see it end. I’m not ready for 90 degrees just yet (not that I ever really am ready for it), and I’m really not ready for it when I still had the heat on as recently as last Thursday. I still have sweaters in my dresser drawers, for heaven’s sake, and I have no idea where my shorts are at the moment. Dog and Baby Dog are shedding so much that not only do I have a fur carpet, but I can’t believe they can have any hair left on their bodies. Baby Dog is not yet used to having the door open, and every sound she hears is cause for barking. A car a quarter of a mile away needs barked at. A dead branch falling from a tree 100 yards away needs barked at. The cabin is tight enough that during winter we can’t hear many outside noises. Now that the windows are open, and the screens down, lots of little and unimportant noises are heard again. Baby Dog has to bark at them all, even the blue jays scolding outside the door or the great-horned owl calling from further up the mountain early in the morning. Yelling at her doesn’t make her stop. The only way she stops barking is for me to go to the door, look outside and confirm that there’s nothing to worry about. Then she stops barking at that but soon, very soon, Something Else needs barked at. I hope she gets over this before long or it’s going to be a very long summer. The mountain has reached that point in the spring where the greenery has exploded. Of course, the unseasonably warm temperatures that neared 90 degrees over the past two days had a lot to do with that. Even early last week (or mid-week when I took this photo) the mountain was stuck in early spring, with just a little greenery here and there. Today, my view of the mountain to the west is disappearing as the greenery thickens. Many of the summer’s bird residents are also returning. On Friday evening I heard the first wood thrush song, and that was distant enough I had to listen carefully to make sure I really did hear it. By Saturday morning, the wood thrush were outside my front door, singing their lovely song throughout the woods. I’ve also seen a few warblers—butterbutts (yellow-rumped warblers for those who insist on proper names) and black-and-white warblers. Likely, there were more species, but it’s not always easy to get binoculars on those little devils, and I have poor hearing in the range where they sing, so I can’t readily identify them that way. So spring is now fully arrived. Only the song of the pewees, the last of the summer residents, is yet missing from the dawn chorus. The chorus itself is not yet as loud as it will be in another week or so. The summer residents are here, though not yet in their full numbers. I am ever surprised, even after living through so many season changes, at how much a change the seasons really bring. Spring really is like living in a different place from winter or fall or even summer. Perhaps the changes are less pronounced to those who live in cities. Surrounded by the forest, as I am, the seasons are so profoundly different from each other that sometimes it feels as though I am living in an entirely different place from one to the next. It’s like I have four different living places or that I live in four different states throughout the year. It’s a bit of a variation on "take a trip, never leave the farm." In my case, I never leave the cabin, but you get the idea. If we really lived as though every day was Earth Day, I believe the world around us would today look a lot different. First, if every day was Earth Day, all of us would know more about our earth. Earth Day wouldn’t be a one-day event. The information that is disseminated (and often too soon forgotten or put aside) on Earth Day would be added to every day. People would start to connect the dots that, say, recycling is better than tossing things out and that, perhaps, not buying that case of plastic water bottles in the first place is better than recycling. And that’s just a single example. The knowledge base increase would be huge and that can only be to the good. If every day was Earth Day, we would treat the earth better. That would be second nature to us. Once you’ve seen a lady’s slipper blooming in your woods, could you cut down the woods where they grow? What would it look like today if we treated the earth as well as we treated our family’s pet cats or dogs? If every day was Earth Day, I don’t think we’d have many lawns any more. I think we’d allow the forest or the prairie or to grow right up to our doorsteps. We would share the natural landscape, not try to dominate it or destroy it. If every day was Earth Day, we wouldn’t need books like Last Child in the Woods. Kids would be in the woods and the streams and the prairies and meadows and playing in their front forests and sharing their front forests with the what normally grows and lives there. If every day was Earth Day, I think we’d understand that have a whole other range of things to consider when we are choosing building sites. Maybe we’d still build that factory, but we might choose the site differently. And we’d be a lot more aware of and willing to properly dispose of whatever waste industry created. If every day was Earth Day, maybe we’d still build that house, but we’d place the driveway so it wouldn’t disrupt the lady’s slipper, because we’d know the lady’s slipper was there. Ah, if only every day was Earth Day. 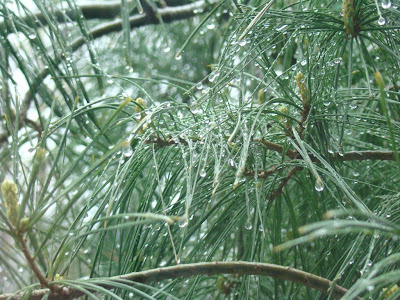 Rain, a good soaker, moved across the mountain yesterday. With a nearly 6 in. precipitation deficit, the rain is welcome. Although I like sunshine as much as the next person, a rainy cycle with a day or so of sun in between the next rain is what this area needs for a few weeks. The problem with rain is that it’s rare to get the kind of rain you really need. You might get too much or too little. It might fall in a torrent and all run off. Too much or too little and the crops are ruined, the berries burst or shrivel. It’s amazing anything ever turns out right, though somehow it usually does. This rain so far is doing okay. I say so far because it’s still raining and the result could still go the other way. But for now it’s a decent rain, a tad on the heavy side but it could be worse. The rain is bringing out the silliness in the local birds. A flower pot base left outside becomes an impromptu bird bath that tempts titmice and cardinals alike. They flap and roll and splash and seem to be having a wonderful time. I know from long experience that if I go out and buy an actual birdbath, the birds will ignore it all summer. So much happened around the cabin this weekend that I should have enough topics for this blog for two weeks. But this being spring, tomorrow is likely to be just as busy as two beautiful and warm spring days this past weekend. 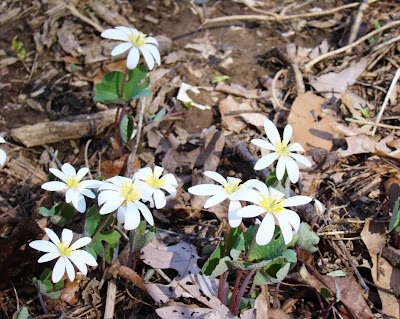 But to start, the bloodroot is blooming. This year the blooms lasted almost two days, so I suppose the flowers qualify as a two-day wonder this year. I counted the blooms I saw at the cabin and came up with 33 blooms yesterday. The odd thing is that the flowers are concentrated in one area not far outside the cabin door. I virtually never see the plant outside of this one small spot, though since the blooms don’t last very long, perhaps I am just missing them elsewhere. On Sunday I went out for a little hawkwatching, accompanied by Dog. The sky was right but the wind turned more easterly than I expected. Still, I saw a few hawks, though no Broad-winged hawks, which is what I was hoping for. I did have a nice sighting a little later of 6 loons, likely common loons. Since I live on a mountain, in the middle of eastern deciduous forest, I see loons only during migration. Still, as I was on my back deck when I saw them overhead, I do put them on my "yard" bird list. If I can see them from my property they count—at least on my list. What else? Well, I had everything from a group of wild turkeys crossing the road, stopping in the middle and deciding to lay down on the warm macadam for a while, oblivious to my desire to proceed along the road. Then I had a large snapping turtle crossing the road a few miles from the cabin, which stopped traffic in both directions for a while. The two little deer that ate my juniper bushes in late winter were back, still chewing, still at the juniper bush. The towhees have arrived, as have the blue-gray gnatcatchers. The pileated woodpecker is investigating large holes in standing trees. In short, it was a busy weekend around the cabin. After the slowness of winter, this much activity is almost overwhelming. I don’t mind. It just takes a little getting used to. 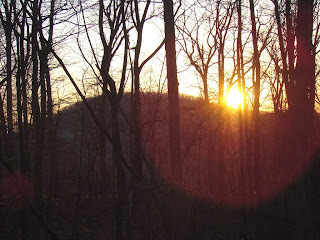 As anyone who reads Roundtop Ruminations regularly knows, I rarely post on weekends. That’s when I’m spending as much of my time outside as I can (and when I’m not near a high-speed internet connection). But I’ve decided to try something different, thanks to the magic of scheduled posting. 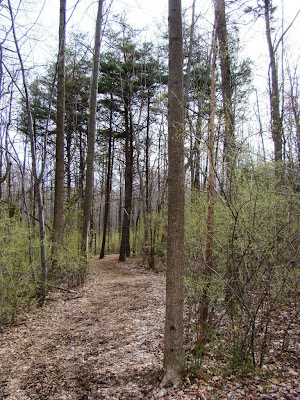 I’m going to post a listing of upcoming nature and outdoor events in southcentral Pennsylvania. I’ll post whatever I can find, though I know it’s not a comprehensive list. 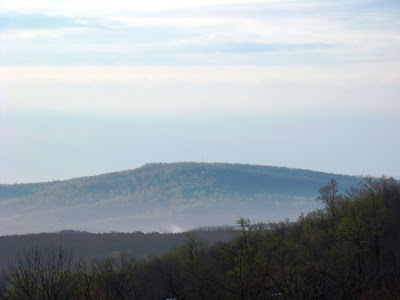 Each week I routinely check out the events at places around my area to see what's going on, and after a mere almost 4 years of blogging, it suddenly occurred to me: why not post these events on Roundtop Ruminations? So that's what I'm going to do. If you or your organization has something you’d like posted, let me know, and I will add it. For now, let’s just say I’m going to try and post events through the summer. Ah, the spring beauties are up. 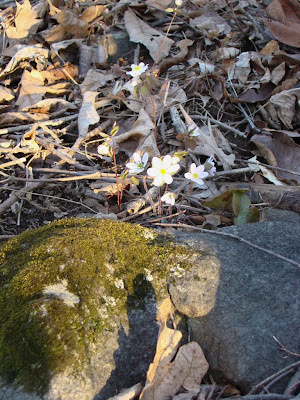 This most delicate of woodlands flowers is often the first to bloom around my cabin in the spring. All at once, I am seeing them everywhere in the woods. They weren’t there yesterday morning, but by the time I arrived home last evening, I found dozens of them. The trout lily has bloomed as well, though maddeningly for me the flower seems to close whenever I have my camera in hand. The bloodroot was close to blooming last evening, so it might bloom today. As it is a one-day wonder, all the shouting might be over with by the time I get home tonight. I hope not. I hope I will get to see it whenever its day of glory is this year. So the woods are starting to awaken again. For today, I am just happy to have clear skies and a warm sun again. It’s been too long since I’ve had that, even for a winter-loving woman like me. Although warmer weather is called for today, up until today warm weather has been in short supply here on Roundtop this spring. And that could turn out to be a good thing for warbler watching in another week or so. At least that’s what I’m hoping. For the past few years, winters were mild and spring came early. The trees leafed out early but the beautiful spring warblers that migrate through arrived at their regular times. Their inbred sense of migration timing tells them when they should arrive to catch the bugs that appear at the same time as the leaves begin to open. But, by the time the warblers arrived, the leaves were long open, the bugs gone and the warblers blew on through like their tails were on fire. They kept heading north, trying to find that sweet spot where bugs and leaves match their own needs. The result for me is that for the past few years I haven’t had many warblers to look at. Now even in a good year, warblers are usually beautiful little frustrations. They are often high in the trees, often hidden behind a leaf, usually moving faster than the hand can move binoculars. Ah, but sometimes, they are so sweet. On those rare occasions, these little jewels are close, out in the open, they sit still and I can look at those lovely, tiny little birds for hours. Over the years, I’ve had some memorable warbler mornings. One year I came home from working the night shift, pulled into the driveway and was surrounded by a dozen or more chestnut-sided warblers, most at head level and all rather put out that I was attempting to drive into my own driveway, which after all, didn’t I know belonged to them? Another time I stepped out onto the front deck and found a hooded warbler calmly bouncing in the driveway, just a few feet away. Or the time a flash of yellow zoomed past the window and when I went outside to investigate I found a pair of Kentucky warblers. Most years aren’t that spectacular, though it is a rare year when I don’t see something interesting or uncommon. Last year and the year before fell into that category. In any event, the slower start to this spring’s leafiness has me hoping that 2009 might turn out to be a decent or even an average year for warblers here on the mountain. I’ll let you know how that turns out. We’ll still have to wait a week or two or maybe three to know the answer to that one. 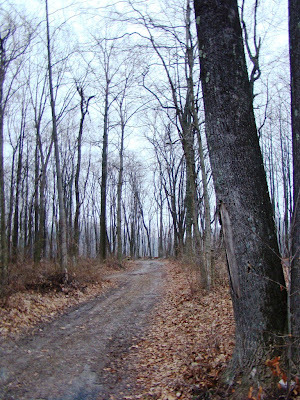 My photo today was taken on one of the trails around Roundtop. 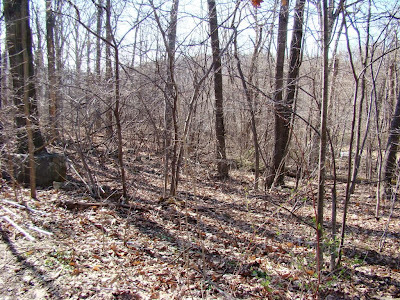 The understory is starting to show signs of greening up, though I didn't find any flowers or fiddleheads just yet. Perhaps in another day or so. Sunset photos have been difficult to come by lately. Overcast skies, rain or simply heavy cloud cover has foiled several attempts to get one. This photo was taken April 10, 20 days after my previous entry in this year’s experiment #2. My plan for experiment #2 was simply to document how the location of the sunset changes over time. 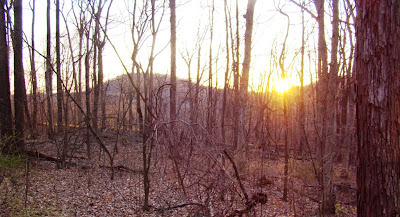 My first photo was taken a month or so after winter solstice, which is the day the sun sets at its most southern spot. The summer solstice will be where it sets at its most northerly spot. In all the years I’ve lived here at the cabin, I’ve been vaguely aware that the sun sets in different spots, but frankly I never paid too much attention to it. I knew it set far to the south in the winter and much further to the north in the summer but that was about it. So this year I just wanted to pay attention to how the sun’s setting position changes over a few months time. So far, I’ve been surprised at how much the sun set changes over a short period of time. The second photo today is the first photo I took back in February. Then, the s un set has now moved the whole way across the distant mountain and is starting to edge up along the nearer one. The nearer mountain wasn't even visible in my first post. The final photo today is the one I took back on the vernal equinox in March, 20 days earlier than today's photo. It's quite a difference! Last night I was driving back to the cabin, and as I approached Roundtop I reached an open area near the north parking lot. As I always do, I slowed down and looked around and on the other side of the now-locked entry road, I saw a red fox standing in the middle of the road, with a tiny something at the fox’s feet that didn’t reach above the adult fox's knees. I couldn't tell what the little blob was, but there was something in the adult’ fox’s posture that made me think it was a little fox-ling. So I drove into the ski area, and headed up the access road from inside the area. I pulled out my camera, rolled down my window and hoped that the fox would still be there. At first, I didn’t see anything and I thought the fox had simply gone into the woods. But then, I saw the little one. 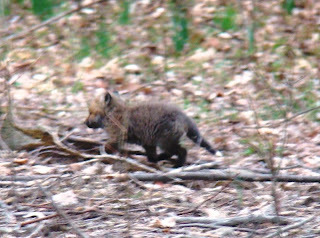 This is the tiniest fox I’ve ever seen. It’s not even red yet, it’s mostly brown-ish. I never did see mom, but I heard her barking and encouraging the little one to move, which it did. Now this isn’t the best fox photo I’ve ever taken, but as it was dusk, and I was inside the car, it’s not too bad. I didn’t linger. I didn’t want to upset the baby and/or mom so I turned around and headed back to the cabin. I’m sorry for the light blogging lately. I’ve been harboring a cold and haven’t been out all that much. I think I’ve turned the corner on this one, now, though, so I’m planning to resume usual blogging schedule. Rain has moved across the mountain today, bringing some much-needed April showers. The region is now nearly 6 inches below normal for rainfall. Today's rain will help that a bit, though I don't think I'm supposed to get more than 1 inch today. Still, it is a help. The buds on the smaller trees are about to pop. 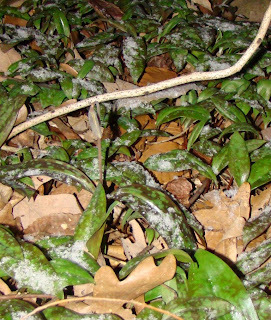 The dog-toothed violet is soon to bloom--or maybe not. Tonight and tomorrow night frost is expected, perhaps even a killing frost, though that is less likely. In any event, it's probably likely that the little frost will be the coldest night before fall rolls around again. For now, it is warm enough on a gray and rainy morning but not so warm that a little hot tea wouldn't taste pretty good in the next few minutes. I took a brief walk in the woods yesterday afternoon before the rain settled in. The forest still doesn't look too spring-like. Bare trees, only a few with buds. I find a little onion grass, a tiny handful of green grass but little else. Likely the dryness of the forest floor has something to do with that. The temperature this spring has been about normal, if tending towards the cooler side of normal. So this rain, despite the cold that will follow for a few days, will do my area a lot of good. I am already thinking this is one of those springs where nothing much happens for a long time--and then it will all explode at once. 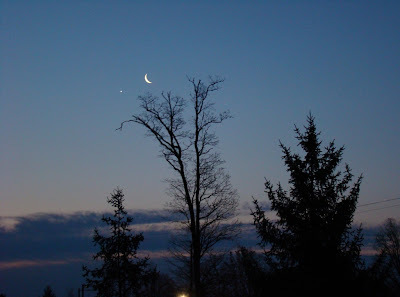 It will be the kind of spring where you can almost see the change from hour to hour let alone from morning to evening. Then I will likely complain that it's too fast, that there's too much to see. Such is spring. My photo today was taken as the weather was moving in but before the rain actually started. Roundtop is in the distance, still with a little snow. That is disappearing really fast in this rain. 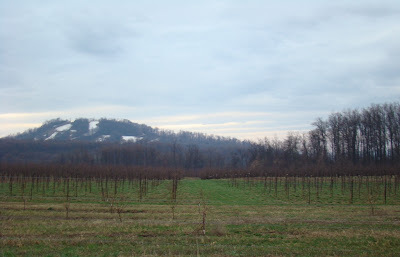 The orchard still looks pretty barren--no blossoms yet. The orchard and the forest alike are in waiting, soon to take center stage. Fifteen minutes of light snow was just enough to leave a few patches on the ground last evening. Snow in this area on this date qualifies as a late snow, but it’s by no mean the latest. Measurable snows have fallen up until the last day of April here, and a trace of snow has been recorded into early May. Still, the odds are that this little bit of snow will probably be our onion snow, which is what is what we call an early spring snow, usually considered to be the last snow of the season. Onion snows are so named as they come right when onions are pushing up in the gardens. As I have always understood the term, an onion snow has to be more than just flurries. Flurries don’t count. The snow has to be at least lay on the ground, though it doesn’t have to be measurable. In some areas, apparently an onion snow is any snow that comes when the onions are up, but where I live an onion snow must also be the last snow of the season. Naturally, you don’t always know which little bit of snow is going to be the last snow of the season, so this gives the retired folks who meet for coffee at the local restaurants something to debate the next morning. 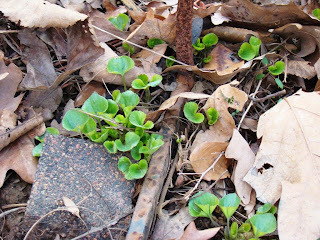 Perhaps you can also see in my photo today the flower stalk of the dog-toothed violet that will soon be in bloom. It’s not every year that I have snow on a flower stalk of anything, so I thought that was interesting enough to make it today’s photo. All the new greenery around the cabin right now is tiny stuff. 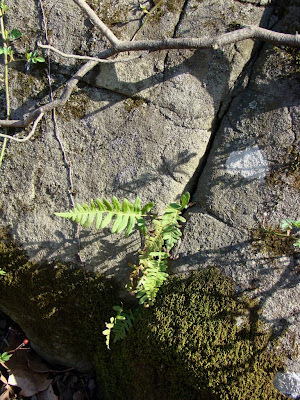 This fern, which has grown out of the rock for years now, is the largest of the lot. The fern is a common polypody, which can make a living and can grow where virtually nothing else can. The second photo is some of the greenery from trout lilies (or yellow dog-toothed violet) that grows just outside the cabin door. I have to be careful not to step on it when I'm loading or unloading the car. Although there's always a lot of leaves, I don't usually get many flowers from the plants. I will likely see 2-3-4 violets, never all at once. With this many leaves, though, you'd likely guess there should be 20 flowers at once. Don't I wish. Maybe some year. The last photo, which includes the rusty iron stake that holds my wind chimes, is of wild purple violets. I always have a group of them at this spot, which I really have to be careful not to step on as they are within 3 inches of the last step out of the cabin door. They always grow in this spot too. I have other wild violets here and there around the property, but I've always wondered if the original plants that grow in this spot were transplanted here or not. It just seems amazing to me that I'd have wild violets right at the foot of the steps appearing here of their own accord. Regardless, they have been here ever since I've lived in the cabin. Every evening when I get home, I wander through the driveway, checking to see what's sprung up since the morning. I see a little more progress every day. Seedlings that were unidentifiable in the morning are now taller and are somewhat more identifiable. Every evening I come home and see more tiny spots of greenery that weren't there 12 hours before. I look forward to this twice daily ritual. For me, one of the amazing things about spring is how quickly things change. Partly, it's because winter seems unchanging through much of it. But equally important is an erroneous perception that I used to have. My perception was that plants grow so slowly it takes days to see change and even then you had to really pay attention to see the difference. That's not true. At all. When I pay attention, I can see the change between morning and evening. I still find that amazing. Forget June. 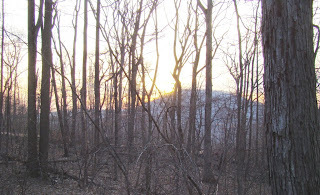 Sunday here on Roundtop was even rarer—a sunny day in April. And not just sunny but perfectly clear, the sky a gem-quality shade of blue. I took the opportunity to wander from one end of my little property to the other, pausing every step or two to examine the seedlings poking up through the ground. The greening of the forest floor is underway, buoyed by the Friday rain and the Sunday sunshine. Most of the seedlings are still mostly unidentifiable, each with just two small leaflets that look like every other seedling, from radishes to violets and poison ivy. A few things—the dog-toothed violets (trout lily) for one—are already identifiable. In the case of the those, the two-toned leaves make for an easy identification. The arrival of spring birds is still slow. I now regularly hear a phoebe in the morning, but not multiple phoebes. The siskins are still coming to my feeders, as are the juncos, but the year-long residents like the titmice and chickadees seem to be less frequent, as though they are off finding natural food in the forest more tempting than my seeds and nuts. My photo today is not of the forest floor, however. Instead it is of my view to the west, a reminder to me of the view that will disappear within a few weeks. Once the leaves come out, I will be encased in greenery, and the sight of the next range of mountains will vanish until sometime in late October or early November, a full half a year away. But for now, the trees haven’t even started to bud, and the view is still with me. Rain is still in short supply here, though this morning I am surrounded by thick fog and mist. I’m starting to see some more signs of greenery around the cabin. 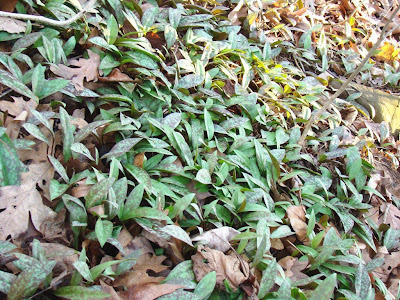 Even on the forest floor, many of the seedlings are now developing their second set of leaves. That pretty much leaves them still unidentifiable, though given where the tiny plants are located, I’m thinking that many of them are likely mayapples. I have reached something of a milestone at the cabin. The pine siskins are still around, which makes this the first time I’ve seen them here in April. In fact, this is the first year they’ve been regular feeder visitors throughout a winter. I’ve had them show up before here and there, for a day or so at a time. However, this winter they moved in during January and have appeared every day since then. 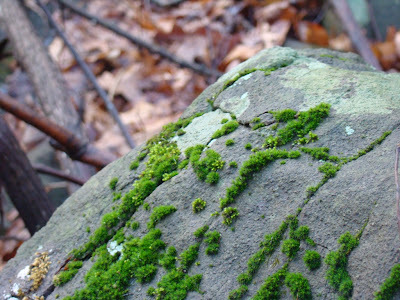 My photo today shows moss on one of the boulders in my front forest. The moss has gotten quite green over the last week and seems to be growing nicely. This year I, like many people, am planning to grow more vegetables than I usually attempt. Here in the woods, I don’t get much sunlight, so my attempts at growing things are not always successful. Last year my neighbor, who gets a little more sun than I do, had nice success with her tomatoes and that has spurred me to attempt some, too. I will grow the veggies on my back deck, where I should avoid deer and rabbit issues, though will still likely have to deal with the raccoons and opossums. At this point the little plantlings are safe and under a plastic dome on my kitchen table. They will remain there for several weeks yet but I will keep you apprised of my progress (or lack thereof) as time goes by. There’s no getting around it. It’s a gloomy morning. It’s not raining hard enough for me to settle in with a mug of tea or a good book and actually wallow in the gloom. When it’s not really doing anything outside, that seems excessively over-indulgent. So for now I am soldiering through, trying to pretend it’s just another day, which it is. My area certainly needs rain, and I don’t begrudge any actual days of rain, but when it’s not raining and is still this gloomy, doesn’t that seem excessive, too? Get on with it, already! Rain or don’t rain but let’s not just gloom along for days on end.